2015-10-06 NEW • Distribution Release: Proxmox 4.0 "Virtual Environment"
Rate this project Proxmox, a company which builds commercial computing solutions based on Debian GNU/Linux, has released Proxmox Virtual Environment 4.0. The new release includes support for Linux Containers (LXC), Bash shell completion and IPv6 support. "We are proud to announce the final release of our Proxmox VE 4.0 - based on the great Debian Jessie. Watch our short introduction video, What's new in Proxmox VE 4.0? Linux Containers (LXC): The new container solution for Proxmox VE is fully integrated into our frameworks, e.g. this includes our advanced storage plugins like ZFS, Ceph or even DRBD9, full IPv6 support and much more. LXC works with all modern and latest Linux kernels. Bash completion: All our CLI tools support now advanced bash completion, Linux experts will just love it! New Proxmox VE HA Manager for High Availability Clusters: The new HA manager dramatically simplifies HA setups - it works with only a few clicks on the GUI, test it! And it eliminates the need of external fencing devices, watchdog fencing is automatically configured." People who are already running Debian Jessie can install Proxmox Virtual Environment 4.0 on top of their existing installation. Further information can be found in the distribution's release announcement. Download: proxmox-ve_4.0-0d8559d0-17.iso (678MB, MD5, pkglist). 2019-04-11 Distribution Release: Proxmox 5.4 "Virtual Environment"
Proxmox is a commercial company offering specialised products based on Debian GNU/Linux. The company's latest release is Proxmox 5.4 "Virtual Environment" which is based on Debian 9.8 and offers improved flexibility in high availability environments. "The new features of Proxmox VE 5.4 focus on usability and simple management of the software-defined infrastructure as well as on security management: Installing Ceph via user interface with the new wizard - Integrated into the Proxmox VE software stack since 2014 the distributed storage technology Ceph comes with own packages and support from the Proxmox team. The configuration of a Ceph cluster has already been available via the web interface, now with Proxmox VE 5.4 the developers have brought the installation of Ceph from the command line to the user interface making it extremely fast and easy to setup and configure a hyper-converged Proxmox VE/Ceph cluster. Additionally, enterprise on a budget can use commodity off-the-shelf hardware allowing them to cut costs for their growing data storage demands. Greater flexibility with high availability improvements - Proxmox VE 5.4 provides new options to set the HA policy data centre-wide, changing the way how guests are treated upon a node shutdown or reboot. This brings greater flexibility and choice to the user." Additional information can be found in the company's release announcement. Download: proxmox-ve_5.4-1.iso (655MB, SHA256, pkglist). 2019-03-26 Distribution Release: Proxmox 5.2 "Mail Gateway"
2018-12-04 Distribution Release: Proxmox 5.3 "Virtual Environment"
Proxmox is a commercial company offering specialised products based on Debian GNU/Linux. The company's latest release is Proxmox 5.3 "Virtual Environment" which includes several improvements for storage and containers. "Proxmox Server Solutions GmbH today unveiled Proxmox VE 5.3, its latest open-source server virtualization management platform. Proxmox VE is based on Debian Stretch 9.6 with a modified Linux Kernel 4.15. Ceph Storage has been updated to version 12.2.8 (Luminous LTS, stable). Proxmox VE 5.3 brings many improvements in storage management. Using the Disk management it is possible to easily add ZFS raid volumes, LVM and LVMthin pools as well as additional simple disks with a traditional file system. The existing ZFS over iSCSI storage plug-in can now access LIO target in the Linux kernel. Nesting is enabled for LXC containers making it possible to use LXC or LXD inside a container. Also, access to NFS or CIFS/Samba server can be configured inside containers. For the keen and adventurous user, Proxmox VE brings a simplified configuration of PCI passthrough and virtual GPUs (vGPUs such as Intel KVMGT) - now even possible via the web GUI." Further details can be found in the distribution's release announcement. Download: proxmox-ve_5.3-1.iso (641MB, SHA256, pkglist). 2018-10-09 Distribution Release: Proxmox 5.1 "Mail Gateway"
Proxmox is a commercial company which offers specialized products based on Debian. The company recently launched Proxmox Mail Gateway version 5.1 based on Debian 9 "Stretch". "Proxmox Mail Gateway 5.1 comes with Debian security updates, new features, bug fixes, and GUI improvements: The new Transport Layer Security (TLS) policy provides certificate-based authentication and encrypted sessions. Users can now set a different TLS policy per destination domain, in case they need to prevent e-mail delivery without encryption, or to work around a broken STARTTLS ESMTP implementation. Configuration of the TLS policy can be done via GUI. TLS is also possible on internal SMTP port/traffic. The updated user management now allows a new help desk role enabling help desk staff to access the quarantine. Proxmox Mail Gateway 5.1 supports SMTPUTF8. This will fix the problem with some non delivered Google mails. 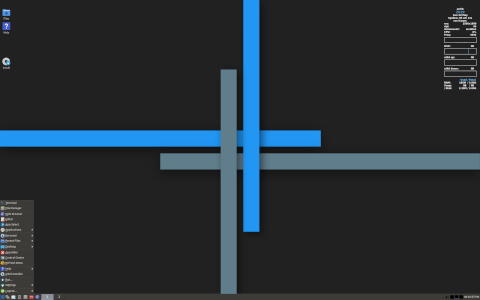 Smarthost ports: Editing and showing smarthost port is possible. On the web-based user interface, the Proxmox developers improved the Spam Quarantine section adding keyboard shortcuts (for Whitelist, Blacklist, Deliver, and Delete)...." Further information can be found in the company's press release. Proxmox 5.1 "Mail Gateway" can be downloaded from the company's downloads page. 2018-05-16 Distribution Release: Proxmox 5.2 "Virtual Environment"
Proxmox Virtual Environment (VE) is an open-source virtualisation platform for running virtual appliances and virtual machines, based on Debian. The project's latest release is Proxmox VE 5.2 which features built-in support for Let's Encrypt free security certificates. "Proxmox VE 5.2 comes with new features like the Cloud-init package for automation of VM provisioning, a CIFS/SMB storage plug-in, and the Let's Encrypt certificate management via the graphical user interface. The Proxmox development team further expands the cluster functionality making the creation and configuration of Proxmox VE clusters possible via the web interface. 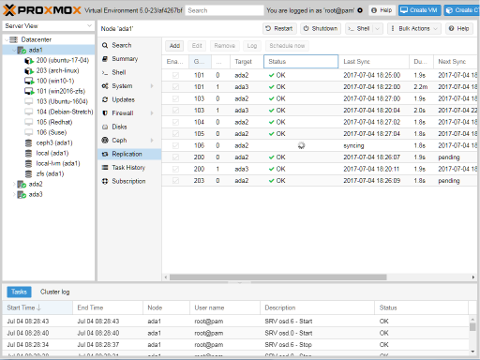 The open-source virtualization management platform Proxmox VE 5.2 is based on Debian 9.4, and an updated and modified Linux Kernel 4.15. Proxmox VE 5.2 now supports Cloud-Init, a multi-distribution package that handles initial setup of a virtual machine as it boots for the first time, and allows provisioning of VMs that have been deployed based on a template. With the Cloud-Init package Proxmox users can easily configure host names, add SSH keys, set up mount points or run post-install scripts via the graphical user interface." Additional information can be found in the distribution's release announcement. Download: proxmox-ve_5.2-1.iso (611MB, SHA256, torrent, pkglist). 2018-01-23 Distribution Release: Proxmox 5.0 "Mail Gateway"
Proxmox is a commercial company which offers specialized products based on Debian. The company recently launched Proxmox Mail Gateway version 5.0 based on Debian 9 "Stretch". 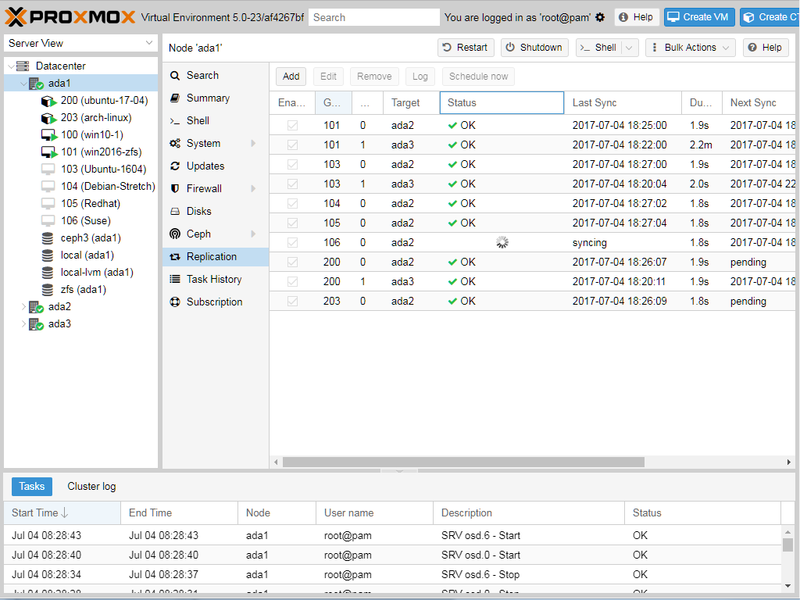 "Proxmox Server Solutions GmbH today announced the major release of its open-source email security solution Proxmox Mail Gateway 5.0. The Proxmox Mail Gateway is a full featured mail proxy deployed between the firewall and the internal mail server and protects against all email threats focusing on spam, viruses, trojans, and phishing emails. Version 5.0 is now completely open-source and licensed under the GNU AGPL v3. The Mail Gateway is a complete operating system based on Debian Stretch 9.3 with a 4.13.13 kernel, and has a new RESTful API, includes support for all ZFS raid levels, comes with LDAP, IPv4 and IPv6 support, and with a new interface framework based on Sencha ExtJS. For businesses Proxmox offers a new subscription-based support model with access to a stable enterprise repository." Further information can be found in the company's release announcement and highlights post. Proxmox 5.0 "Mail Gateway" can be downloaded from the company's downloads page. 2017-10-24 Distribution Release: Proxmox 5.1 "Virtual Environment"
Daniela Häsler has announced the availability of a new version of Promox Virtual Environment, a Debian-based platform for running virtual appliances and virtual machines. The new version, Proxmox 5.1 "Virtual Environment", is based on Debian 9.2, includes Ceph 12.2 and version 4.13 of the Linux kernel. "Proxmox Server Solutions GmbH, developer of the open-source virtualization platform Proxmox Virtual Environment (VE), today announced the release of its version 5.1. Most important enhancement is the software-defined storage solution Ceph v12.2 Luminous which is now stable for production and included in the enterprise support agreement. Proxmox VE 5.1 is based on Debian 9.2 and comes with a 4.13 Linux kernel. Proxmox VE 5.1 comes with production-ready Ceph cluster packages. The virtualization platform integrates Ceph v12.2 Luminous, the long term stable release of the software-defined storage solution. Users can now implement Ceph clusters as distributed storage solution in production. Help and support is provided by the Proxmox team via the Proxmox VE subscription service. Ceph is a distributed object store and file system designed to provide excellent performance, reliability and scalability." Further information is provided in the release announcement. Download: proxmox-ve_5.1-722cc488-1.iso (589MB, SHA256, torrent, pkglist). 2017-07-04 Distribution Release: Proxmox 5.0 "Virtual Environment"
Proxmox Virtual Environment (VE) is a Debian-based commercial distribution for running containers and virtual appliances. The Proxmox company has announced the release of a new version of the distribution which is based on Debian 9 "Stretch". "We are very happy to announce the final release of our Proxmox VE 5.0 - based on the great Debian 9 (codename 'Stretch') and a Linux Kernel 4.10. Replicas provide asynchronous data replication between two or multiple nodes in a cluster, thus minimizing data loss in case of failure. For all organizations using local storage the Proxmox replication feature is a great option to increase data redundancy for high I/Os avoiding the need of complex shared or distributed storage configurations. With Proxmox VE 5.0 Ceph RBD becomes the de-facto standard for distributed storage. Packaging is now done by the Proxmox team. The Ceph Luminous is not yet production ready but already available for testing. If you use Ceph, follow the recommendations below. We also have a simplified procedure for disk import from different hypervisors. You can now easily import disks from VMware, Hyper-V, or other hypervisors via a new command line tool called 'qm importdisk. Other new features are the live migration with local storage via QEMU, added USB und Host PCI address visibility in the GUI, bulk actions and filtering options in the GUI and an optimized NoVNC console." Additional information can be found in the company's release announcement. Download: proxmox-ve_5.0-af4267bf-4.iso (556MB, SHA256, pkglist). 2017-03-25 Development Release: Proxmox 5.0 Beta 1 "Virtual Environment"
Proxmox Virtual Environment (VE) is a Debian-based commercial distribution for running containers and virtual appliances. The Proxmox company has announced the release of a new development snapshot for the distribution, Proxmox 5.0 Beta 1 "Virtual Environment", which is based on Debian 9 "Stretch". "We are proud to announce the release of the first beta of our Proxmox VE 5.x family - based on the great Debian Stretch. With the first beta we invite you to test your hardware and your upgrade path. The underlying Debian Stretch is already in a good shape and the 4.10 kernel performs outstandingly well. The 4.10 kernel for example allows running a Windows 2016 Hyper-V as a guest OS (nested virtualization). This beta release provides already packages for Ceph Luminous v12.0.0.0 (dev), the basis for the next long-term Ceph release. In the coming weeks we will integrate step by step new features into the beta and we will fix all release-critical bugs." Additional information can be found in the company's release announcement. Download: proxmox-ve_5.0-c155b5bc-1.iso (549MB, MD5, pkglist).